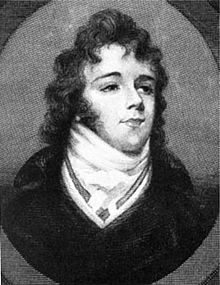 George Bryan Brummell, (June 7,1778-March 30,1840) better known as Beau Brummell, reigned long enough over the fashionable elite of Regency England to be remembered forever as the one man responsible for bringing the modern man's dark suit into being. Is it really Brummell? Certainly captures his air. Around his neck is a quizzing glass. His star, however, was meteoric, spiraling downwards and landing with an unearthly thud in poverty in Paris, where he died at the age of 61. But how did he get there? Brummell, however, was fabulously successful at his social climbing--for a time. He was accepted into the elite "Carlton House set" (the Prince's closest circle of friends) and rose widely to fame on the tails of his faultless sense of style, coupled with an air of aristocratic disdain that few could emulate--even the real bluebloods. He'd caught the attention of the Prince earlier, when a member of the Prince's personal regiment, and, with royal favor, rose to the rank of Captain. True to form, however, he gave up his commission when the regiment was called to quit London for Manchester, which, in his estimation, wasn't worth his presence. During his reign in Polite Society, his opinion on matters of dress and style was law. He reigned supreme in the art of tying the cravat, and was said to spend up to five hours in dressing. Even the Prince attended one of the Beau's famous "dressings" while the latter went through piles of textile in pursuit of the perfectly tied neck cloth. His valet referred to the heap of discarded cloths as "our failures." A proper cravat was no small matter! Difficult to imagine such painstaking precision over a neck-cloth in our world of tee-shirts and jeans, today. 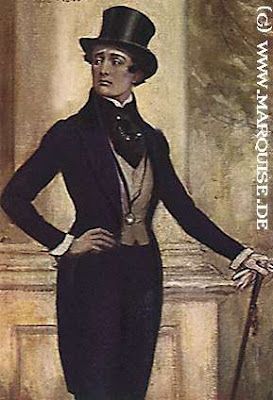 But even then, of course, the Beau was fastidious to the point of dandyism, self-centered and absorbed; but he did much to tone down the clothing of the ton [upper classes] from the flamboyance of the previous century, including discarding breeches in favor of trousers and pantaloons. His ideal in dress was a quieter elegance--definitely something the Prince, prior to Brummell's influence--lacked. Why did Brummell flee London for Paris? To escape debtor's prison. Brummell claimed many friends among the upper classes but even these allies could not continually keep him out of the duns. After all, they frequented the same men's clubs and spent time at the same gaming tables. They, too, lost money and lots of them were often strapped for cash themselves. Nearly all men of the upper classes gambled and a good portion of them were ruined as a result. The Prince himself was in debt for nearly all of his life, not primarily from gaming, but because of his enormous expenditures on luxuries, including architecture, furniture, paintings, clothing, and food. The Beau, unwisely, was an avid gambler. Neither sense or stark financial facts kept him from participating at the tables, and pride probably often necessitated it. In addition, it cost a great deal to live in the style that was considered "fashionable." Unlike his blue-blood friends, he had no landed family estate providing income, so he was actually doomed from the outset. When at last he faced arrest, the townhome which he took great pains to appoint in "the first order of elegance," was abandoned to the creditors and he fled like a hunted fox to France. So much for sartorial elegance. He has claims to our sympathy, but the last words he probably ever spoke in the Prince Regent's hearing were, "Alvanley, who's your fat friend?" It was a dig at the corpulent Prince and hit its mark--they never spoke again. Once good friends, the Prince had given the Beau the "cut direct"--ignoring him after addressing Alvanley. Brummell, humiliated and angry, made the famous remark which has survived long after his demise. I believe it is a fitting epigraph: Beau Brummell was entirely too sure of himself for his own good. I love the famous engraving of the Beau (top, right) for the way it shows the cocky attitude that was eventually his undoing. Not only did Brummell succeed in permanently alienating himself from the Prince, one of the most powerful personas of the day--but he ended up, not too many years afterwards, living in squalor as an unhappy exile in France. Still, there's something undeniably appealing about Brummell, making him a staple in many Regency Romances. Perhaps it is the idea of his rise to stardom in an age that has rarely been paralleled for its snobbery and closed doors. It makes one shudder to think of the meticulous Beau ending up in squalor. Small irony for an age, however, that boasted enormous splendor in the upper classes and the filthiest of living conditions for its lowest, including unbelievable numbers of street children. Ah, the Regency! The time of "elegant madness," Jane Austen, Napoleon, pleasure gardens and servants in livery; King George gone mad (only he didn't, technically. See my article on what really happened to the King, here) and Almack's. The Regency is all of this and much, much more...it's why I love to write novels set in this era! 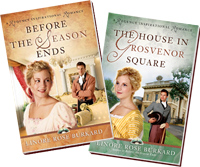 Linore Rose Burkard is a Regency Romance writer and the author of Before the Season Ends, the very first Inspirational Regency in the market. She also writes YA/Suspense as L.R.Burkard. Linore teaches workshops for writers in Ohio, is a mother of five, and still homeschools her youngest daughter—preferably with coffee in one hand, and an iPad in the other. For book news, contests, giveaways and more, join Linore's free mailing list. 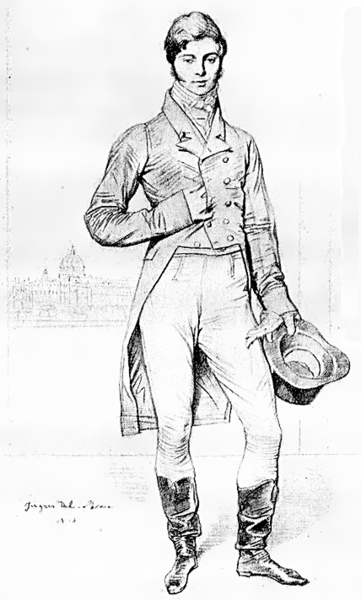 Interesting blog about Beau Brummell. Throughout the ages, men seems to be brought low in one way or another when they are so focused on themselves. I can only chuckle thinking about men being dressed like that today--some men cannot tie their own necktie. a dandy and a fop. Very interesting post, Linore. I have always heard of Beau Brummell but I was unfamiliar with his life. As with all of us, he had some character flaws!